Miss Sloane is a 2016 political thriller film, directed by John Madden and written by Jonathan Perera. The film stars Jessica Chastain, Mark Strong, Gugu Mbatha-Raw, Michael Stuhlbarg, Alison Pill, Jake Lacy, John Lithgow, and Sam Waterston. The film had its world premiere on November 11, 2016, at the AFI Fest, and began a limited theatrical release in the United States on November 25, 2016, by EuropaCorp, before expanding wide on December 9, 2016. It was released in France on March 8, 2017. It received generally positive reviews, with Chastain's performance being particularly praised. Despite that it was a box office failure grossing only $9.1 million against its $13 million budget. Elizabeth Sloane is a cutthroat lobbyist who has been called to appear at a congressional hearing led by Senator Ronald Sperling to answer questions about possible violations of Senate ethics rules during her tenure at Washington D.C. lobbying firm Cole Kravitz & Waterman. Three months and one week earlier, Sloane's firm is approached by gun manufacturing representative Bill Sanford to lead the opposition to the proposed Heaton-Harris bill that would expand background checks on gun purchases, specifically by targeting female voters. Sloane ridicules Sanford's idea and is later approached by Rodolfo Schmidt, the head of rival lobbying firm Peterson Wyatt, to instead lead the effort in support of the bill. Sloane agrees and takes most of her staff along with her, though her assistant Jane Molloy refuses to leave. At Peterson Wyatt, Sloane selects Esme Manucharian to conduct the majority of the firm's media appearances, and they begin to make significant progress in garnering votes for the bill. Sloane confronts Esme with knowledge of her background as having survived a school shooting. Even though Esme does not want to disclose the information, Sloane reveals Esme's secret during a live television debate. Later, Esme is held up at gunpoint while leaving her office, but her attacker is shot dead by another civilian who is legally carrying a gun. Gun rights supporters capitalize on this event, which causes the Heaton-Harris bill to lose support in the Senate. This is compounded by the news of the Senate inquiry into Sloane's lobbying practices. Returning to the congressional hearing, Senator Sperling produces a form requesting approval of overseas travel for a Senator. It was filed by a non-profit organization but completed in Sloane's handwriting, indicating she violated Senate ethics rules with her involvement, as a lobbyist, in arranging the travel. In answer to other questions, Sloane swears under oath that she has never practiced illegal wiretapping. In her final statement at the hearing, Sloane admits she anticipated the opposition might attack her personally if Peterson Wyatt made too much progress with the Heaton-Harris bill. She reveals that she had someone (Molloy, her former assistant) secretly working for her, and that she did use a wiretap – which recorded Sen. Sperling accepting bribes from Cole Kravitz & Waterman boss George Dupont. Ten months later, Sloane is visited by her lawyer in prison: the Heaton-Harris bill passed but at the cost of Sloane's imprisonment and career. The film ends with Sloane being released from prison. In September 2015, it was announced that Jessica Chastain had been set to star in the film, with John Madden directing, from a screenplay by Jonathan Perera. Ben Browning produced, under his FilmNation Entertainment banner, and Patrick Chu executive produced, while EuropaCorp produced and financed the film, and handles worldwide distribution. In January 2016, it was announced that Alison Pill, Jake Lacy, and Gugu Mbatha-Raw had joined the cast. In February 2016, Douglas Smith, Mark Strong, Michael Stuhlbarg, Sam Waterston, John Lithgow, and Enis Esmer also joined, and in March 2016, Meghann Fahy joined the cast of the film as well. Max Richter composed the film's score. Principal photography began on February 12, 2016, in Toronto. In March 2016, Jessica Chastain was spotted on set filming. Production in Toronto wrapped on March 30, 2016. In April 2016, additional shooting took place in Washington, D.C. Principal photography concluded on April 6, 2016. In August 2016, two images of Chastain were released. The film had its world premiere at the AFI Fest on November 11, 2016, and also screened at the Napa Valley Film Festival on November 13, 2016. The film was originally scheduled to be released on December 9, 2016, and was later moved up to November 25. The film began its wide release alongside the openings Office Christmas Party and The Bounce Back, and the wide expansion of Nocturnal Animals. The film was projected to gross $2–4 million in its wide opening weekend, but ended up making only $1.8 million, finishing 11th at the box office. Overall, the film grossed $3.3 million in the United States and Canada, and $5.6 million in other territories, for a worldwide total of $9.9 million, against its production budget of $13 million. Miss Sloane is ranked number 75 by per-theater average on Box Office Mojo’s list of Worst Opening Weekend films released since 1982. 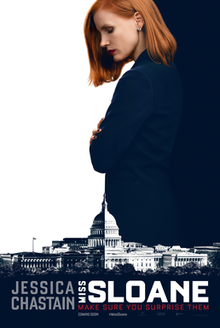 Miss Sloane received generally positive reviews from critics. On review aggregator website Rotten Tomatoes, the film has an approval rating of 76%, based on 182 reviews, with an average rating of 6.5/10. The website's critical consensus reads, "Miss Sloane sits squarely on the shoulders of Jessica Chastain's performance – and she responds with awards-worthy work that single-handedly elevates the film." On Metacritic, the film has a score of 64 out of 100, based on 41 critics, indicating "generally favorable reviews". Audiences polled by CinemaScore gave the film an average grade of "A-" on an A+ to F scale. ^ "MISS SLOANE (15)". British Board of Film Classification. November 28, 2016. Retrieved November 28, 2016. ^ a b D'Alessandro, Anthony (December 7, 2016). "'Office Christmas Party' Hopes To Bring Cheer To Another Dull Weekend; 'La La Land' Tunes Up – Box Office Preview". Deadline Hollywood. Penske Business Media. Retrieved August 27, 2018. ^ "Miss Sloane - International Box Office". Box Office Mojo. IMDb. Retrieved June 3, 2017. ^ Donnelly, Matt (September 12, 2015). "Jessica Chastain Gun-Control Thriller 'Miss Sloane' Sells to EuropaCorp in Toronto". TheWrap. Retrieved January 26, 2016. ^ Kroll, Justin (January 6, 2016). "Alison Pill to Co-Star With Jessica Chastain in Gun Control Drama 'Miss Sloane'". Variety. Penske Business Media. Retrieved April 10, 2016. ^ Sneider, Jeff (January 7, 2016). "'Carol's' Jake Lacy Joins Jessica Chastain in Gun Control Movie 'Miss Sloane' (Exclusive)". The Hollywood Reporter. Prometheus Global Media. Retrieved April 10, 2016. ^ Kit, Borys (January 25, 2016). "'Concussion' Star Gugu Mbatha-Raw in Talks to Join Gun-Control Drama 'Miss Sloane' (Exclusive)". The Hollywood Reporter. Prometheus Global Media. Retrieved January 26, 2016. ^ Busch, Anita (February 11, 2016). "Douglas Smith Joins Jessica Chastain's Team In 'Miss Sloane'". Deadline Hollywood. Penske Business Media. Retrieved April 10, 2016. ^ Penderson, Erik (February 26, 2016). "Bill Milner & Maisie Williams Boot Up 'iBoy'; Ennis Esmer Joins 'Miss Sloane'". Deadline Hollywood. Penske Business Media. Retrieved April 10, 2016. ^ Hunter, Craig (February 18, 2016). "John Madden's Political Thriller MISS SLOAN Starts Shooting With Jessica Chastain". Retrieved April 10, 2016. ^ Busch, Anita (March 8, 2016). "Meghann Fahy Joins Jessica Chastain's Team In 'Miss Sloane'". Deadline Hollywood. Penske Business Media. Retrieved April 10, 2016. ^ filmmusicreporter (August 25, 2016). "'Max Richter to Score John Madden's 'Miss Sloane'". Film Music Reporter. Retrieved August 26, 2016. ^ Chastain, Jessica (February 12, 2016). "And it begins #MissSloane #firstday". Instagram. Retrieved April 10, 2016. ^ Lesnick, Silas (February 18, 2016). "Production Begins on Miss Sloane, Starring Jessica Chastain". ComingSoon.net. Mandatory. Retrieved April 10, 2016. ^ DailyMail.com Reporter (March 8, 2016). "Don't smudge the lipstick! Jessica Chastain sips coffee through a straw on set of controversial gun-control movie". The Daily Mail. Associated Newspapers. Retrieved April 10, 2016. ^ Chastain, Jessica (March 30, 2016). "Thats a wrap #Toronto ! Off to do a bit of press for @thehuntsman , then Ill meet the gang in DC for some additional shooting. This is a very special film. Its a great pleasure to be working again with #JohnMadden He's a wonderful man and a great teacher. #MsSloane #TheDebt pic by #SebastianBlenkov". Instagram. Retrieved April 10, 2016. ^ Siddiqui, Faiz (March 9, 2016). "What's a D.C. Circulator bus doing in Toronto?". The Washington Post. The Washington Post Company. Retrieved April 10, 2016. ^ Morales, Wilson (April 6, 2016). "Gugu Mbatha-Raw Talks Concussion DVD, & Civil War Drama Free State Of Jones". Blackfilm.com. Retrieved April 10, 2016. ^ SSN Insider Staff (April 8, 2016). "On the Set for 4/8/16: Ridley Scott & Michael Fassbender Start 'Alien: Covenant', Benedict Cumberbatch Wraps 'Doctor Strange'". SSN Insider. TSS News. Archived from the original on April 20, 2016. Retrieved April 10, 2016. ^ McGovern, Joe (August 16, 2016). "Jessica Chastain on the gun lobby thriller Miss Sloane". Entertainment Weekly. Time. Retrieved August 16, 2016. ^ Jaugernauth, Kevin (August 16, 2016). "First Look: Jessica Chastain In Oscar Contender 'Miss Sloane'". The Playlist. Retrieved August 16, 2016. ^ Lang, Brent (October 24, 2016). "'Miss Sloane' to World Premiere at AFI Fest (EXCLUSIVE)". Variety. Penske Business Media. Retrieved October 24, 2016. ^ "Miss Sloane". Napa Valley Film Festival. Cinema Napa Valley. Archived from the original on November 18, 2016. Retrieved October 10, 2016. ^ D'Alessandro, Anthony (July 13, 2016). "Jessica Chastain Thriller 'Miss Sloane' To Debut During Awards Season". Deadline Hollywood. Penske Business Media. Retrieved July 16, 2016. ^ "Miss Sloane". Box Office Mojo. IMDb. Retrieved October 19, 2016. ^ Mendelson, Scott (November 14, 2016). "Weekend Box Office: 'Office Christmas Party' Sets Record, 'Miss Sloane' Bombs". Forbes. Retrieved December 12, 2016. ^ "Miss Sloane". Box Office Mojo. Retrieved March 24, 2017. ^ "Miss Sloane (2016)". Rotten Tomatoes. Retrieved August 28, 2018. ^ "Miss Sloane Reviews". Metacritic. CBS Interactive. Retrieved September 19, 2018. ^ CinemaScore [@CinemaScore] (December 9, 2016). "The grade is in for @MissSloaneMovie! Congratulations on a great grade @jes_chastain! #CinemaScore #TheGrade" (Tweet). Retrieved April 10, 2017 – via Twitter. ^ Hannett, Michelle (December 16, 2016). "'Arrival', 'La La Land', 'Hell or High Water' Among The Nominees for the 2016 AWFJ EDA Awards". We are Movie Geeks. Lanier Media. Retrieved December 17, 2016. ^ THR Staff (December 12, 2016). "Golden Globes 2017: The Complete List of Nominations". The Hollywood Reporter. Prometheus Global Media. Retrieved December 12, 2016. ^ Gordon, Tim (December 3, 2016). "The 2016 WAFCA Awards". Washington D.C. Area Film Critics Association. Retrieved December 4, 2016.